This bright safety orange color emergency spill kit is ideal to have around for any emergency chemical or oil spill. Use the sturdy nylon straps to hang the hazardous spill clean up kit on the wall or on equipment. 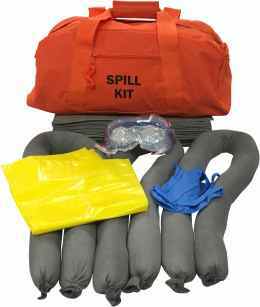 This emergency spill kit has plenty of absorbents for emergency clean up of small spills. Safety goggles and gloves are included for the protection of yourself or your employees. This hazardous spill clean up kit is packed in a sturdy nylon zipper duffle bag with hand carrying straps as well as a shoulder carrying strap if preferred for easy transport. You gain full access to the content of the kit by the full length zipper along the top so the the contents of the kit can be removed quickly. Stay safe and compliant with this emergency spill kit. Available with Universal, Hazmat and Oil-Only types of absorbents. Custom kits available. Very visible, bright safety orange color. Can be hung on wall or equipment. Safety products included such as goggles and gloves. Save on shipping, light weight - FOB CA. Top quality duffle bag filled with top quality absorbents at low prices. Custom hazardous spill clean up kit available. 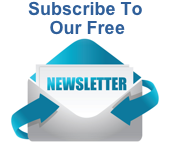 Thank You for Shopping Absorbents Online for All Your Spill Kit Needs!